The Modern Pentathlon was born during the 1912 Olympic Games in Stockholm and still today, 106 years later, the sport is enjoying its first exposure in some countries. Colombia is one such country. 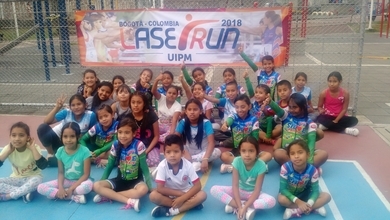 In the city of Cali, on July 15, Laser Run was presented for the first time, giving communities an introduction to the UIPM Sports movement and – potentially – an entry point to the Olympic sport of Modern Pentathlon. The UIPM Global Laser Run City Tour has led to many similar historic dawns taking place across the world, with hundreds of thousands of people combining their passion for running with the fun of shooting a laser pistol in an urban race environment. Major Santiago Cortes Fernandez, a physical education teacher, was the instigator of the Laser Run event in Cali, where the sport was promoted in universities, in a local athletics stadium and among deprived communities in the Siloe ghetto. The Laser Run event in Cali coincided with the Modern Pentathlon event that took place in Barranquilla as part of the 2018 Central American and Caribbean Games – the first pentathlon competition ever organised in Colombia.